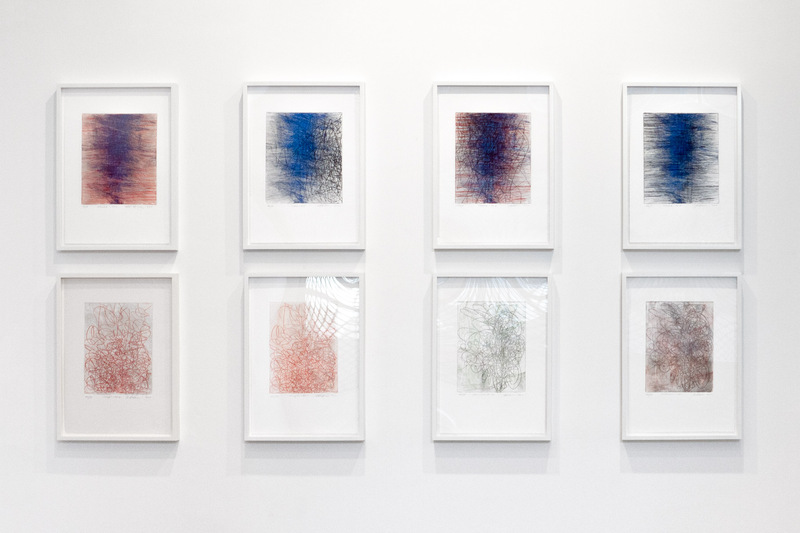 Installation view of eight monoprints by Il Lee in IL LEE: Monoprints, Editions and Paintings at Art Projects International, New York, 2011. 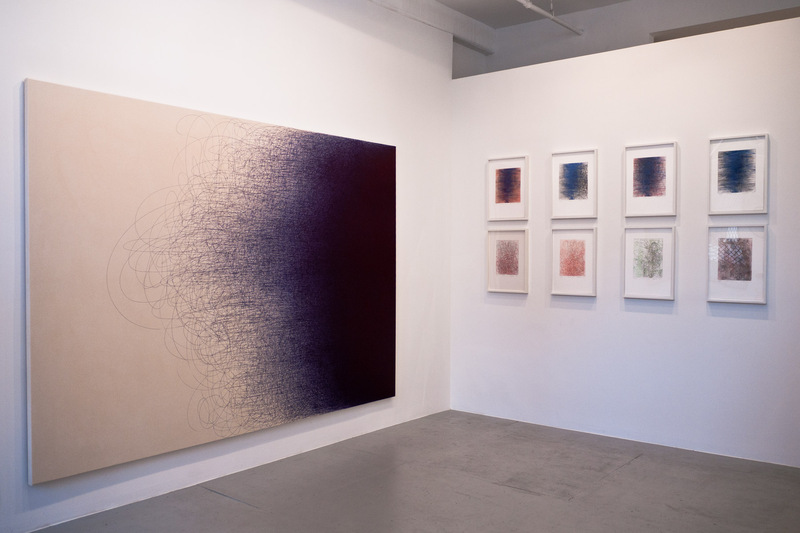 Installation view of IL LEE: Monoprints, Editions and Paintings at Art Projects International, New York, 2011. 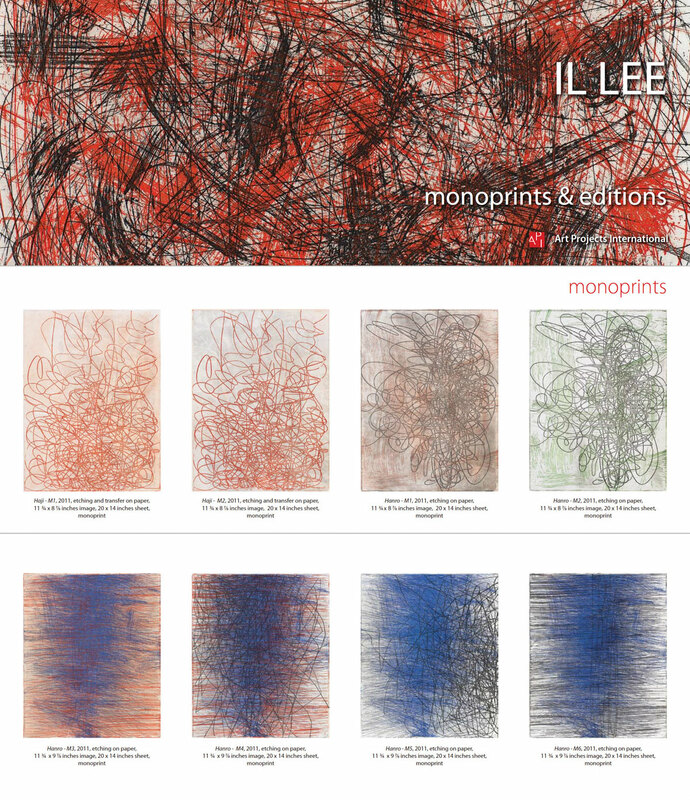 Art Projects International is pleased to present at its new space in Tribeca, a solo exhibition of new limited edition prints and monoprints by Il Lee. 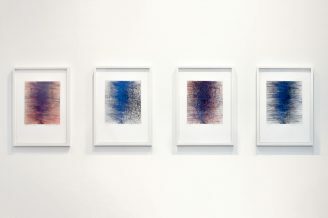 These series of prints, with bright greens and blues and rich oranges and browns, have been created in discrete sets of themes which build on diverse explorations of mark-making. 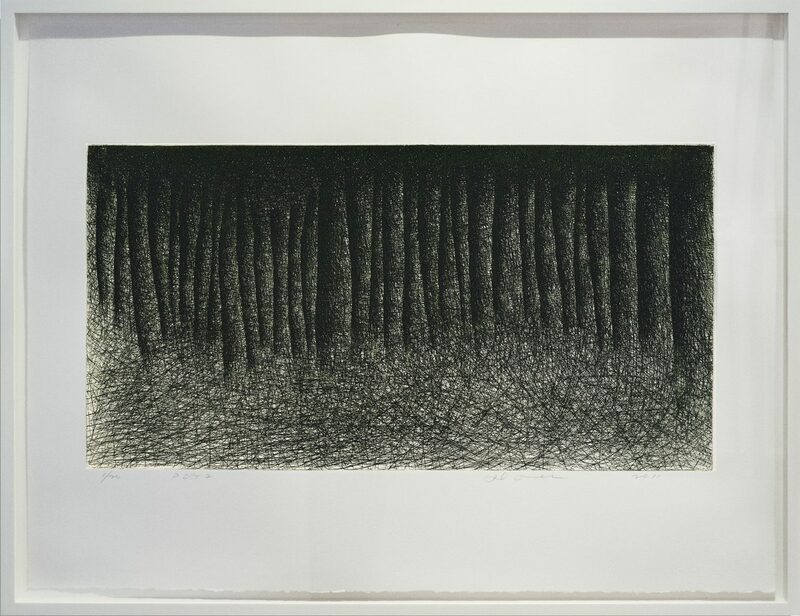 This recent focus on the etching process brings Lee back to a practice that was his initial course of study decades ago. 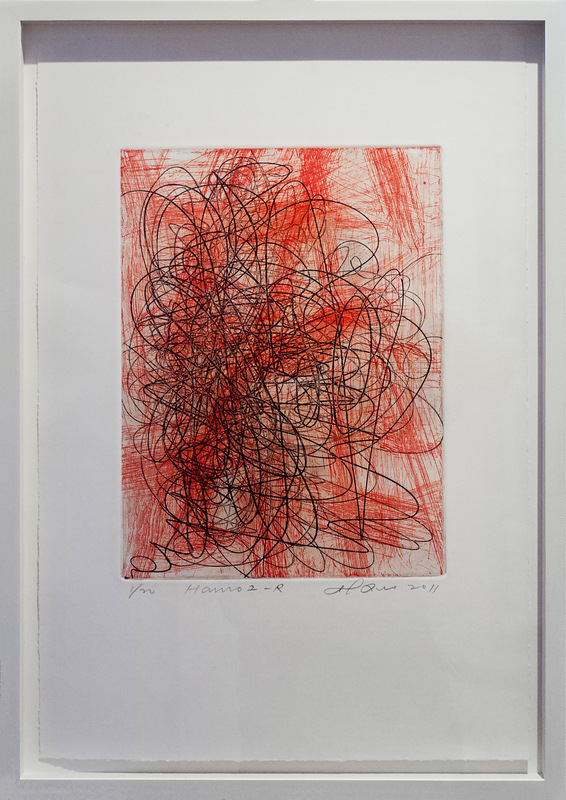 Several paintings made concurrently with the prints also will be included in the exhibition. 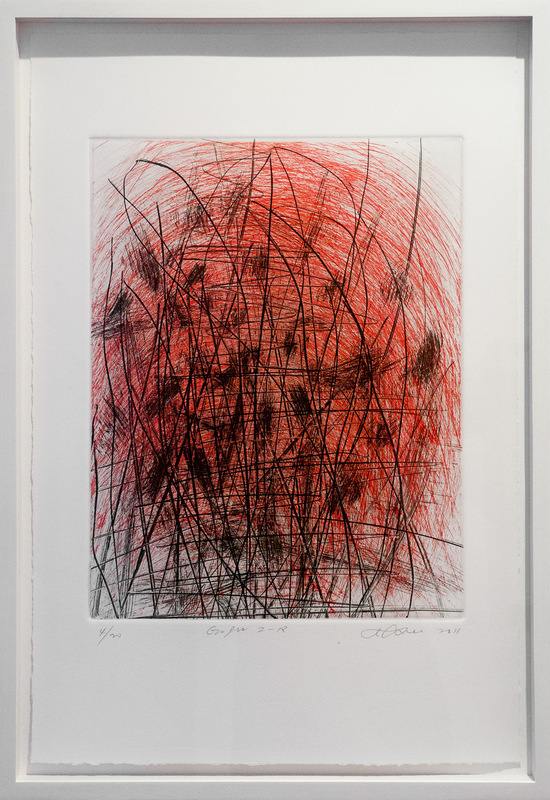 As his large scale works on canvas and on paper suggest at once the monumental and the fundamental dynamism of nature, these new prints convey scale and movement beyond the possibilities their modest formats suggest. 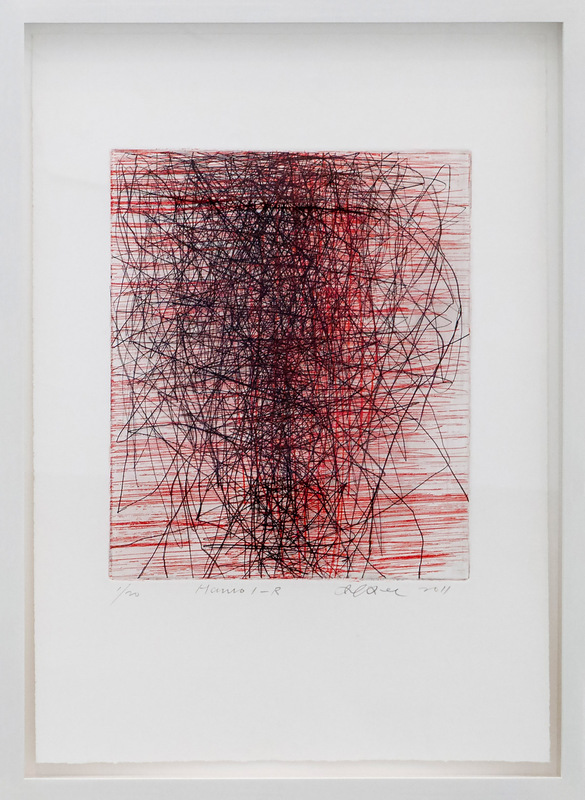 In the monoprint Hanro – M1, etched lines twist around an area of form created by a dense intersection of those same lines. 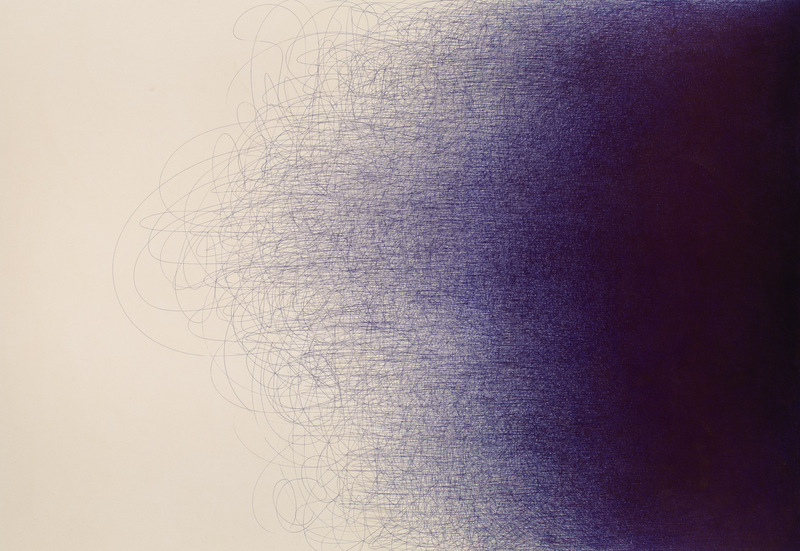 Some lines corkscrew in or out of view; others seem to halt and turn back on themselves. 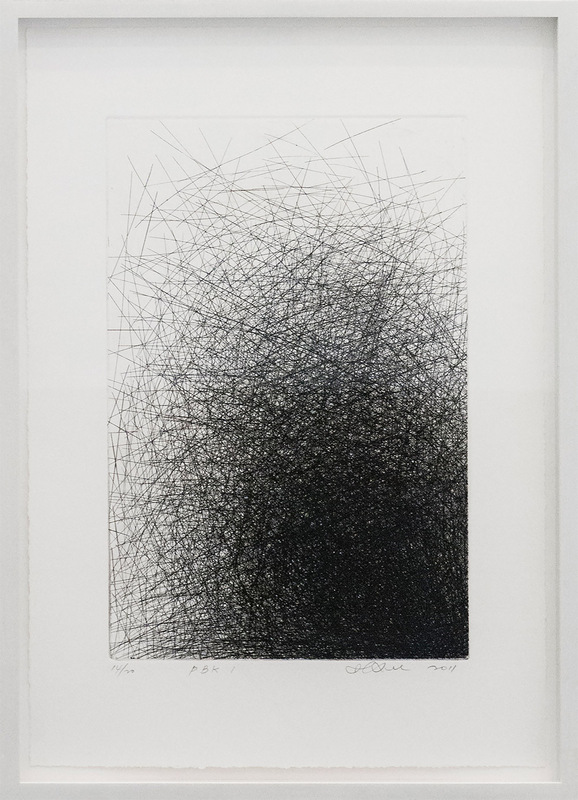 Lee allows, in all these recent etchings, for his lines to have different levels of energy–to develop their own personalities. 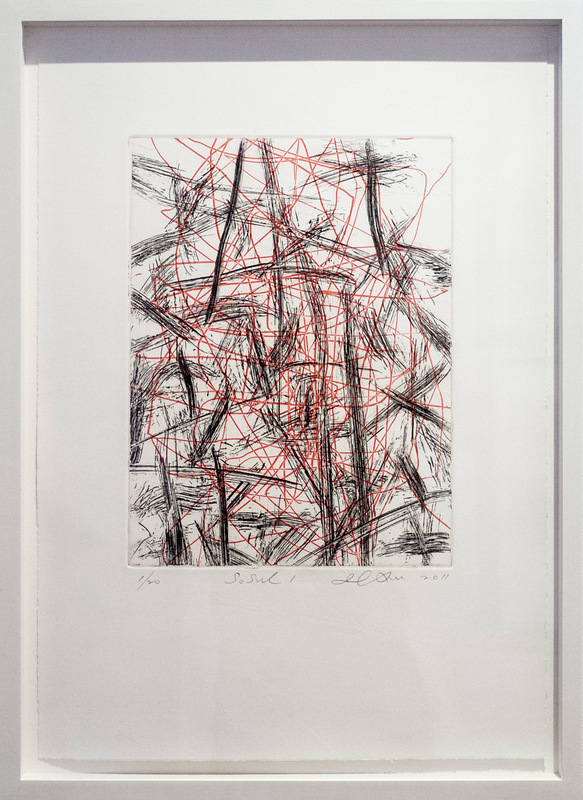 In the Sosul edition, Lee uses a brushstroke effect to bring attention to series of parallel lines creating the effect; Lee trades the massing of infinite line he often uses to build massive form for abbreviated strokes that generate a meditation on process, mark making and composition. 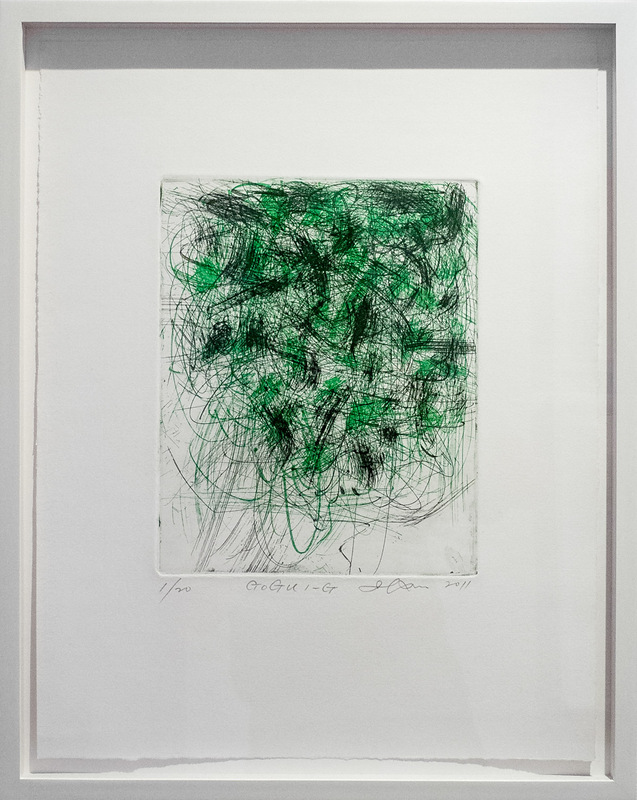 In the Gogu editions, short brushy stubs and grass-like protrusions or bush-like swirls bring abstractions in, not outright but somewhat close, association with nature. 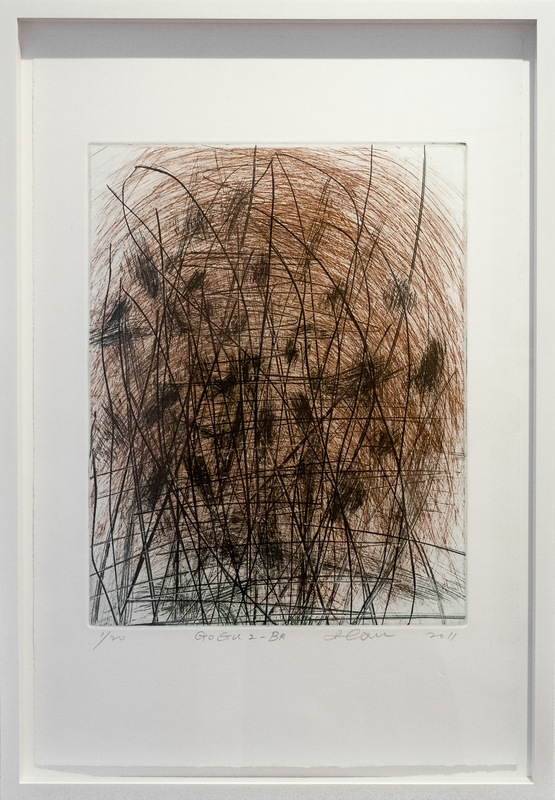 In some editions, Lee’s line is given free reign; it might consume the entire surface, explode from a corner, drop from the sky or rise like smoke. 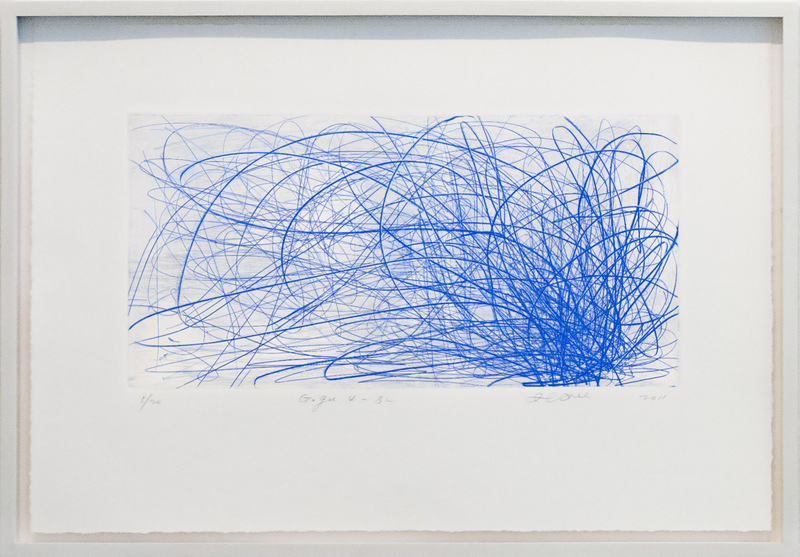 The energy of other prints is evocative of Lee’s earlier ballpoint pen work. 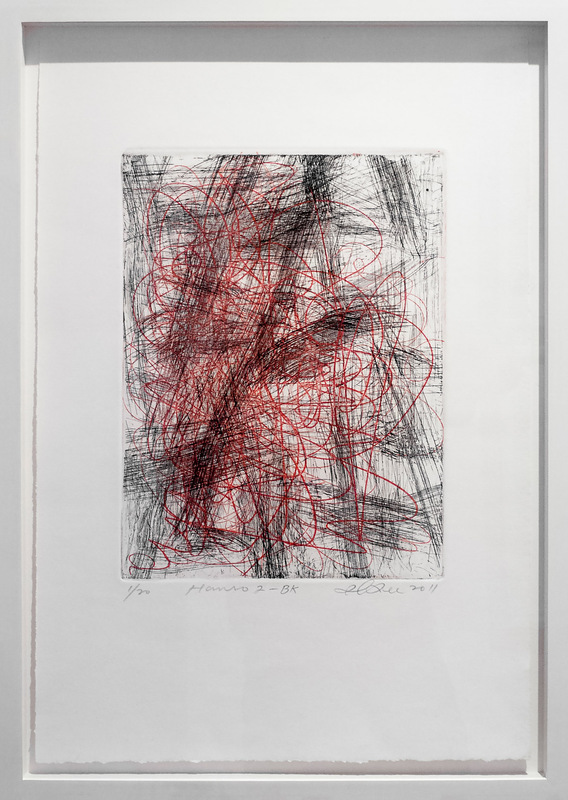 As Lee has done throughout his career with new projects and through experimentation, he extends his lexicon of mark making. 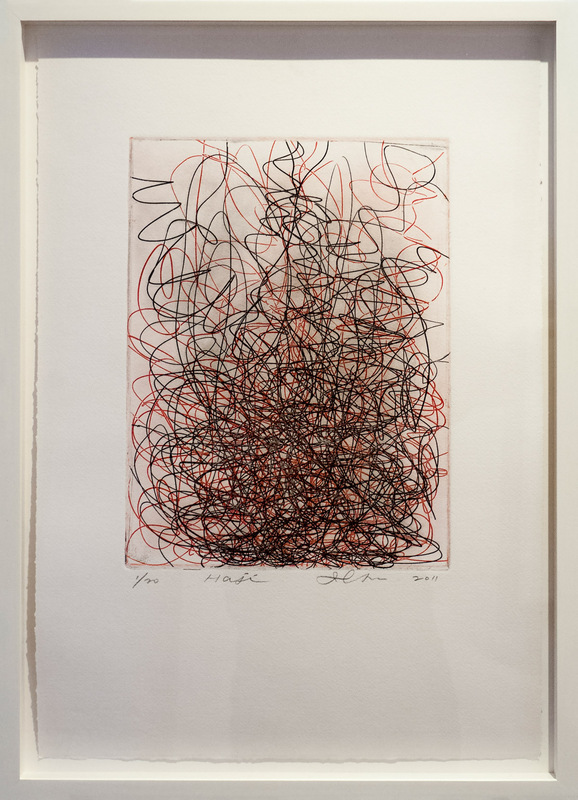 On a press in his studio, Lee uses color and the special qualities of the etching surface to play with both line and the suggestion of line as he creates layering, atmosphere and the impression of near and far space. 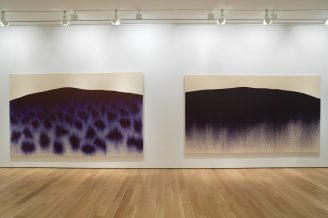 Lee’s prints allow for subtle variations of a different sort than in his paintings, and each practice visibly informs the other. 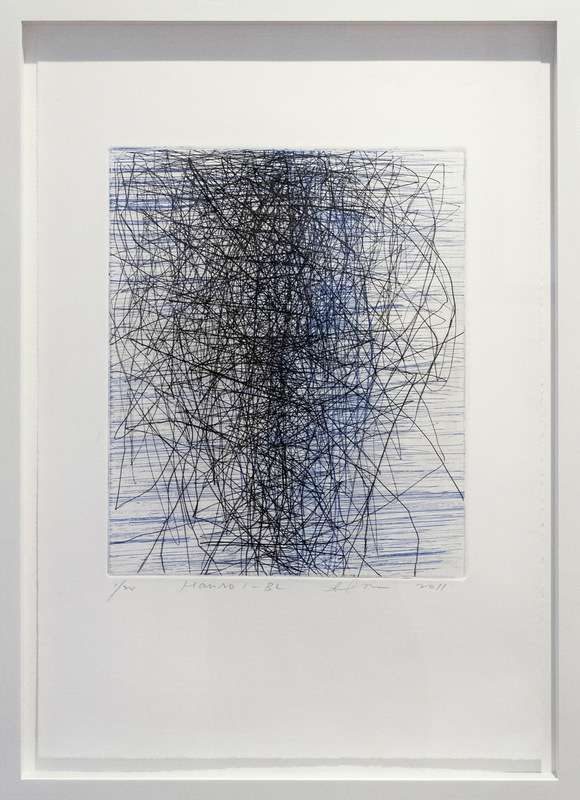 IL LEE is best known for his pioneering work with ballpoint pen that he began more than 30 years ago and continues today. 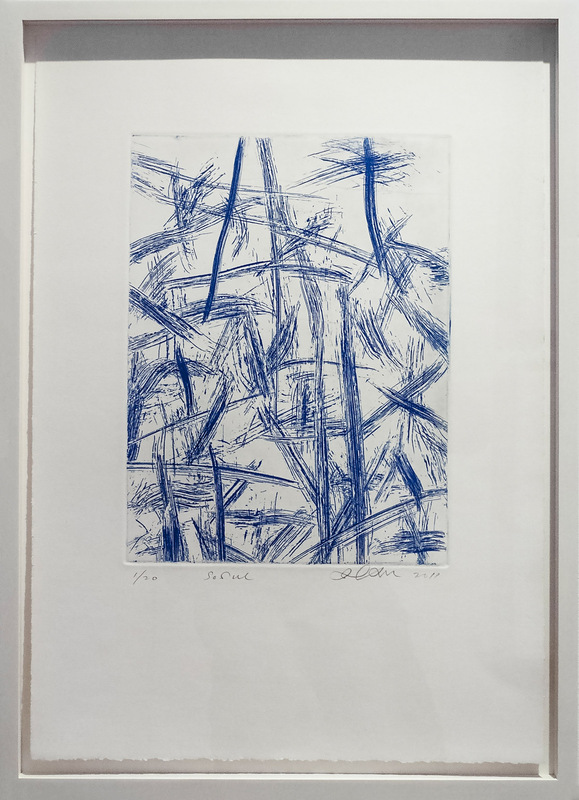 Lee’s recent oil on canvas work and new prints bring the viewer back to Lee’s early investigations of materials and process. 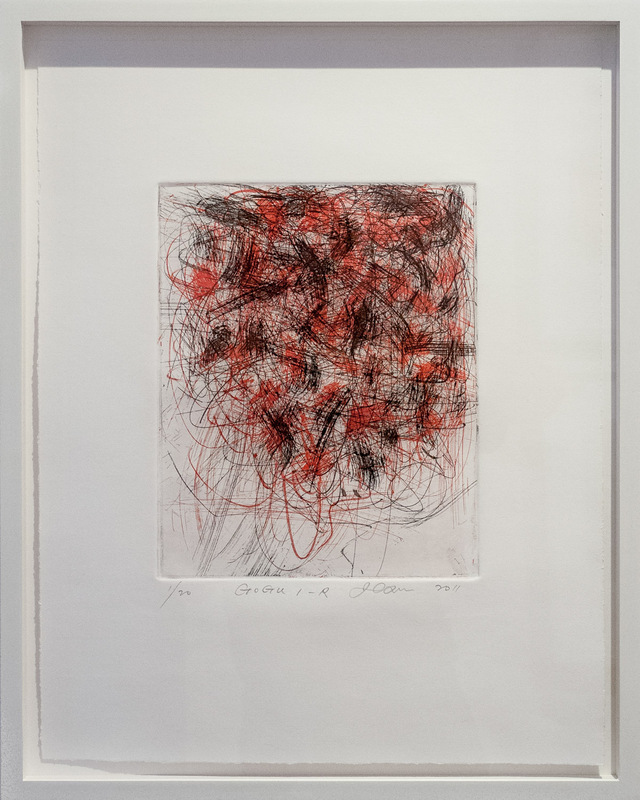 Critically acclaimed and widely exhibited, Il Lee has been the subject of a retrospective at the San Jose Museum of Art and solo exhibitions at the Queens Museum of Art, the Vilcek Foundation, and the Crow Collection of Asian Art in Dallas, Texas. 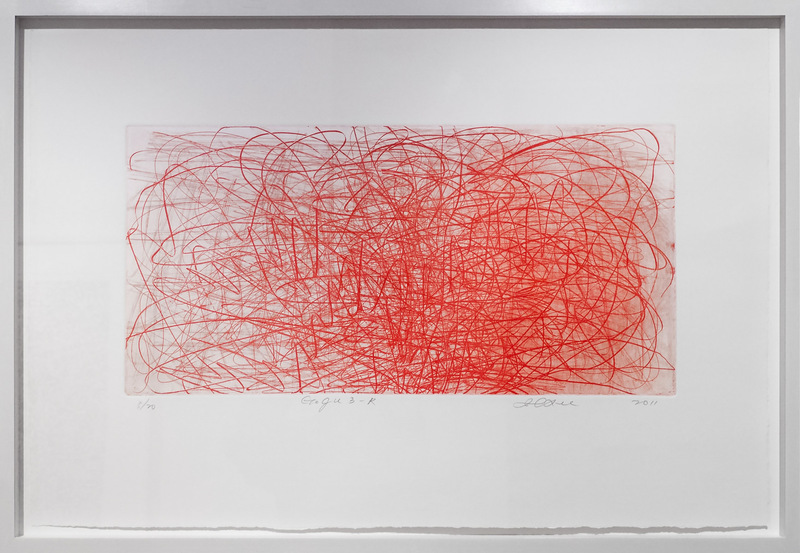 His work has also been exhibited at The Metropolitan Museum of Art, Brooklyn Museum, the Smithsonian Museum of Art and the National Museum of Contemporary Art, Korea.